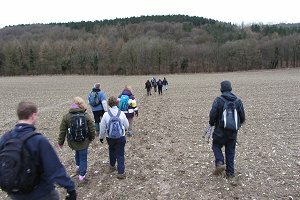 The first walk of 2013 was a joint walk led by the Chilterns Weekend Walkers and was very well attended, with nearly 50 people from several walking groups (including the Chilterns 20s & 30s group, the Maidenhead Walkers and the Berkshire Walkers 20s & 30s group). 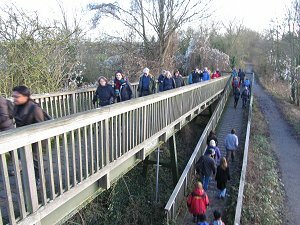 The weather was very pleasant on this New Year's Day afternoon and the Thames Path was crowded with families and couples out for a casual stroll - then we came along! 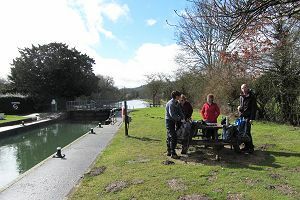 The walk started at Boulter's Lock and took us south along the Thames Path toward Maidenhead town centre where we crossed the river and continued toward Dorney Reach, passing Bray Lock and Monkey Island on the way. We then crossed the river and made our way back to Boulter's Lock via footpaths and roads through Bray and Maidenhead. You can see our route on Google Maps. As it was an afternoon walk, we didn't have a picnic stop. Neither did we have a pub stop, which would have caused chaos with the number of people we had on this walk! 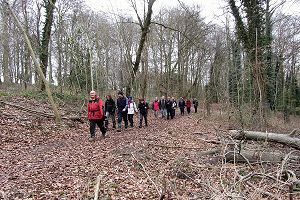 We had 31 people on this walk - and it wasn't even a joint walk with another group! Walking certainly becomes popular this time of year. Probably a mixture of guilt after the Christmas excesses and New Year's resolutions to get fit. The walk started by the cafe on Lord Mayors Drive and headed off along the tarmac paths north of the cafe. But the tarmac didn't last too long before the paths became soggy mud! The route took us out of Burnham Beeches toward the village of Hedgerley. We stopped for our picnic lunch in a field by Hedgerley village before visiting the splendid pub there. The return journey took us through Egypt Woods (north of Burnham Beeches) and Littleworth Common (to the west) back to the cafe. 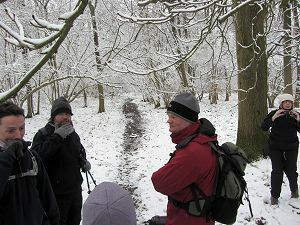 There was a section of path between Egypt Woods and Littleworth Common where the mud was particularly deep and slushy. Nobody had clean boots after this walk! Some of us stopped for a cuppa at the cafe at the end of the walk. See our route on Google Maps. 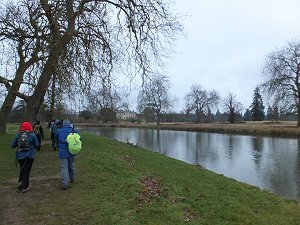 Despite the cold, wet and windy weather, we still managed 14 brave souls on this walk, which replaced the walk from Reading to Pangbourne that we'd originally planned. We started our walk from the car park at the top of White Hill and walked up to Cottington's Hill where the transmitter mast radiates digital television to Berkshire and North Hampshire. 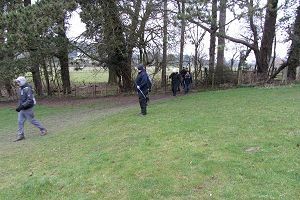 We then descended to the gallops at Park House Stables via the woods on Freemantle Park Down. The initial rain eased off after the walk go going but the cold wind continued. We skirted round the gallops and headed back up the hill en route to Hannington. We stopped for our picnic just as the snow began to fall. Nothing heavy and it didn't settle. After lunch we continued south toward Hannington village through mud and more mud. We must have looked a pretty sight when we got to the pub, stripping of our over-trousers and muddy boots before going in for a pleasant drink in the warm and dry. After the pub we donned our over-trousers, boots, hats and gloves to continue our walk. We passed the church in Hannington and onto the Wayfarer's Walk. As we followed this back to the car park, more snowflakes began to fall. Again, nothing settled. 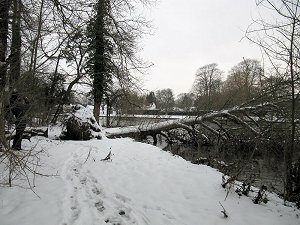 Apart from some very slushy mud in places, the walk was mostly OK, considering the recent weather. I reckon Thames path walk that we had originally planned for today would have been impassable in several places. My thanks go to Neil F for providing the excellent photographs. See our route on Google Maps. Not many of us went on this walk due to snow causing travel difficulties. Only Christine and Lawrence joined Jean-Paul for this walk. My thanks go to Christine for writing the following text and providing the photos. 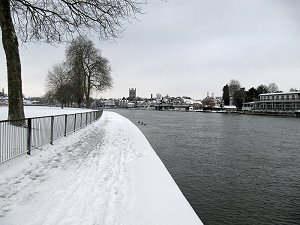 Even though it had snowed the previous day, the trains were running on time, and we arrived at Henley-on-Thames soon after 10:00 am. 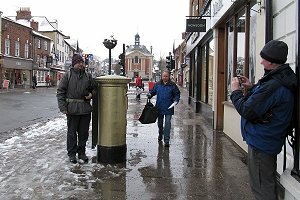 Three of us set off in search of the first gold post box, which was easily located in Hart Street. After the photo opportunity we retraced our steps and set off along the Thames Path. It was disappointing that there was no virgin snow, but good to see one family making a snowman. Lawrence was interested in inspecting what had been done to the public right of way, on the opposite bank, by the new owners of Fawley Court. The path was clearly roped off, the statuary 1m wide according to reports, and if you remained on the path you would be unable to go to the edge of the river bank. The going was surprisingly easy and we met other walkers and the occasional runner. There was even a lone four on the river. After pausing for a coffee at Hambleden Lock we soon left the Thames Path and made our way to Aston. On the outskirts of the hamlet we chatted to a young boy, out for the first time with a sledge and we watched as his father demonstrated what to do with the sledge. The Flower Pot pub provided the only opportunity on the walk to sit down without getting cold and damp. Refreshed we set off through the grounds of Culham Court, where Lawrence continued his inspection of footpaths. 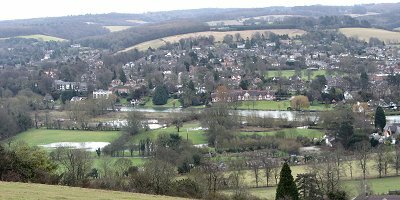 If the new owners have planted a high hedge to obstruct the view of their garden, the magnificent view of the river and the hills surrounding Hambleden is still there, and even more picturesque today with its snowy mantle. Personally I was pleased with how well the route through the deer park had been marked and even a novice walker should have had no problems finding their way. Lawrence, having inspected the footpaths he was concerned about, left us to make his way back to Henley. Near Medmenham I thought we were going to have an unexpected challenge. A large tree had fallen some time recently and as we approached we could see an expanse of water apparently blocking our way. Sadly for those who like a challenge it was incredibly easy to clamber over another fallen tree trunk without getting wet. Looking back after leaving the copse we saw that there was an alternative route away from the river bank. As ever, Danesfield dominated the high ground on the opposite bank shortly before we reached Hurley. This was the part we were wary of. We have to cross the river just before and just after the lock on two charming but steep bridges. 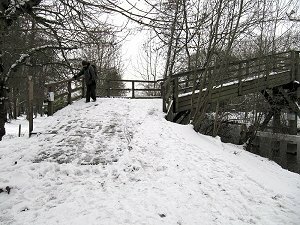 I went down sideways, holding the handrail lest I slip but a more sure footed jogger had no qualms. After passing Temple Lock we began to encounter more walkers and knew we were fast approaching our destination. After more liquid refreshment we found the second olympic gold post box and made our way to the station and home. 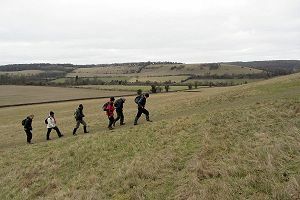 Thanks again to J-P for leading the walk and to Lawrence for being one of the unsung heroes of the Ramblers who help protect the rights of way which we take for granted. After last week's grey weather and snow, we had some lovely sunshine this weekend and it may well explain the good turnout. We had 29 people on today's walk. A pretty good number considering that the Berkshire Walkers 20s & 30s group also had a walk on the same day. 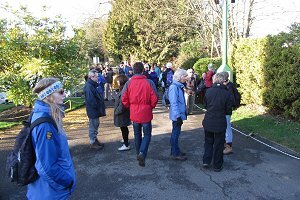 The walk started at the recreation ground on Albert Road and headed west through a very long and somewhat overgrown alley way before leaving the built up area for Blagrave Farm and Caversham Heath Golf Course. Some people think that an alley way can be used as a rubbish dump! Apart from the usual non-biodegradable plastics, we saw all sorts of things from coconuts to rubber chickens, and we also found the dreaded Japanese knotweed growing there! We crossed the golf course and into farmland, following some very muddy paths north-west to Tinker's Green, where we turned east and headed toward the A4074 main road and to the Packhorse pub. We stopped off at the Packhorse for a drink and the weather was just about warm enough for us to sit outside the pub. Suitably refreshed, we set off east through Bardolph's Wood, then south to Tokers Green and then east again through Dysons Wood Farm. We descended into a valley between Dysons Wood and Tanner's Lane, then back up the other side where we stopped for our picnic lunch. It was quite pleasant sitting on the sunny side of valley but the wind reminded us that it was still January. After lunch we headed south through Bugs Bottom and Hemdean Bottom back into town. There was plenty of mud on the way. We then took an urban route through Caversham Heights back to the recreation ground where we'd started. See our route on Google Maps. 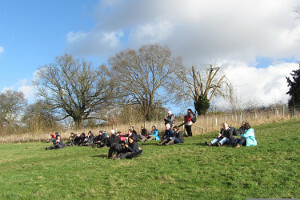 On Sunday 3rd February, we had a walk with a difference. 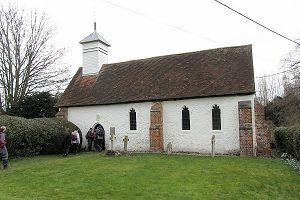 Instead of the usual pub stop, we had been invited to stop off at St Bartholomew's church in Fingest where tea, coffee and homemade cakes were on sale to raise money for the church fund. It was a bit cold and windy when seventeen of us set off from the free car park at Lane End. It must have been sub-zero over night as the puddles in the grass were still frozen and crunched underfoot as we made our way across the green before crossing over the M4 to Wheeler End. We then headed west through farmland, crossing a ploughed field, with our boots getting heavier with every step as the sticky mud built up. Next we passed through Laygrove's Wood and Pound Wood before crossing underneath the M4 to Cadmore End. There was a strangely autumnal feel about this part of the walk, with fallen leaves still in abundance on the woodland paths. Plenty of muddy puddles too! 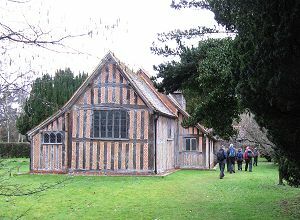 Then we headed south, skirting Hanger Wood and making our way to the picturesque village of Fingest with its 12th century church. This Norman church is quite unusual in that a double gabled pitched roof has been added to the bell tower. The church is now grade 1 listed so no such radical alterations can be made again. 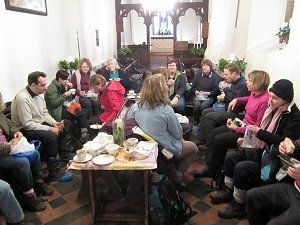 We were able to eat our packed lunches inside the church, which was a welcome alternative to the cold breeze outside, but the main attraction was an array of lovely homemade cakes, scones and hot drinks on sale there. 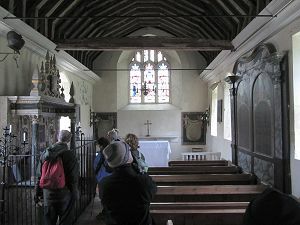 We were made very welcome by the volunteers there, who also told us some of the history of the church. After lunch we continued our walk to the neighbouring village of Skirmett and then through Hatchet Wood, More End and More Common on our way back to Lane End. One of our regular walkers has suggested having an award for the muddiest walk. This one would certainly be nominated. See our route on Google Maps. 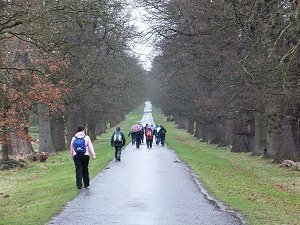 On Saturday 9th February, seventeen people turned up for a joint walk with the Windsor & District group. The attendees were a pretty even mix of Berkshire Weekend Walkers and Windsor & District members plus a couple from other groups and a potential new member. The weather looked rather doubtful to start with. There was sleet falling as I left home but Langley only had a light drizzle as we started the walk, and this gradually subsided into a fairly typical February day - cold and overcast. 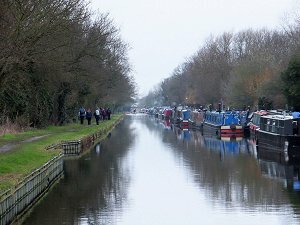 We set off from Langley railway station and joined the tow path, heading west, along the Slough arm of the Grand Union Canal. We didn't stay on the tow path for long, turning off onto a footpath heading north, passing through the Orchard Estate, a hamlet of very smart looking prefabricated housing. Continuing north we passed through some farm land before entering Langley Park. This country park is a mixture of woodland, grassland and a lake. We skirted the lake and Langley Park House before continuing northward along the very straight, tree lined Avenue Drive until we reached the northern boundary of the park, the A412 Uxbridge Road. We crossed it and entered Black Park. Black Park country park is a larger and more densely forested park. We made our way to the Visitors Centre to make use of their facilities before walking round Blackpark Lake and continuing north along Queen's Drive. Eventually we stopped continuing north and turned off to the east and then south, back toward Langley Park. Entering the Park at the north-east corner, we passed through the Temple Gardens on our way to the San Remo Tea Room. It was too early in the year to see the rhododendrons at their best but one or two of the plants were already flowering. The Tea Room wasn't a room at all! It was just a kiosk surrounded by picnic tables, but it was very suitable for us as we would have had to take our muddy boots off if it had been a proper tea room. After coffee, tea and our picnic lunch, we followed Verney Walk to the edge of the park and then turned eastward through farmland toward the village of Iver. We considered stopping at a pub in Iver but the consensus was to carry on instead. (There you are - proof that we're not really alcoholics!) So we walked through Iver and crossed a foot bridge over the M25 motorway before re-joining the Grand Union Canal tow path. 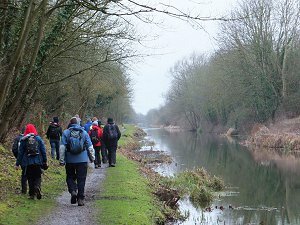 The remainder of the walk followed the canal tow path back to Langley railway station. See our route on Google Maps. My thanks go to Neil F. for providing the photographs of this walk. I didn't make it to this walk as I was on the Weekend Away in the South Downs. The following words and photos were provided by Adam and Jude, who led the walk. 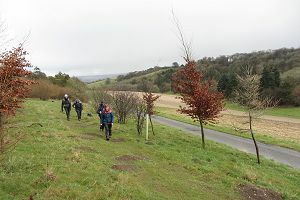 Despite an unpromising foggy start from home, the weather soon picked up and the ten people who came on the walk were rewarded with mostly sunny dry conditions and excellent view (as promised!). 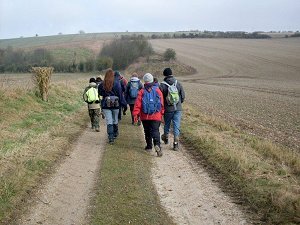 Such a turn-out was encouraging as the walk coincided with the weekend away on the South Downs. 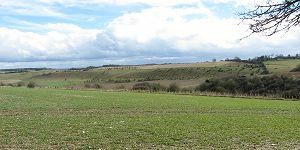 We headed north out of the village and were soon climbing gradually onto the Berkshire Downs with gravel track giving way to scrubby grassland. For a short stretch we were alongside the gallops but no thoroughbreds were to be seen, just a cantering rider appreciating the scenery like we were. 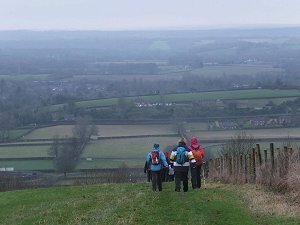 The middle section of the walk was on open downland with great views all round. Lunch was taken at the picturesque hamlet of South Fawley where conveniently on the green two more benches had appeared since the pre-walk giving all but one of us a comfortable perch in a sheltered sun trap. Union flags were dotted around the houses but we were unsure what these marked on this mid-February weekend. The return south to East Garston gently undulated as before, initially passing some large free-range chicken coups whose occupants didn't dare step away from their shelter as a chill wind had picked up by now. After crossing the gallops again we dropped off the Downs and returned to the car park whereon most of us proceeded to the very convivial Queens Arms pub for a post-walk snifter. Although no GPS recording was made during the walk, the approximate route has been recreated and can be viewed on Google Maps. 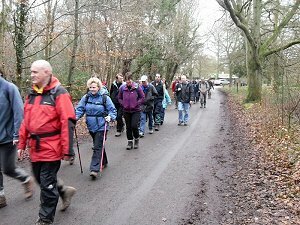 The cold weather (a high of 2°C) didn't put people off coming to the walk on Sunday 24th February. 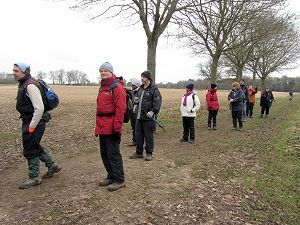 We had twenty-one of us on this walk - and there was another walk at the same time with the Berkshire Walkers 20s & 30s group, so there were even more people out braving the cold. The walk started at the common in Rotherfield Peppard. We passed by the tiny primary school and All Saints church as we headed south-easterly out of the village. We then headed south across country, past Blounts Court to Crowsley. Then we went west to Kidmore End, via Vines Farm (south of Sonning Common). We walked through the grounds of the church with its impressive topiary arch of two yew trees and stopped off next to the village pond. 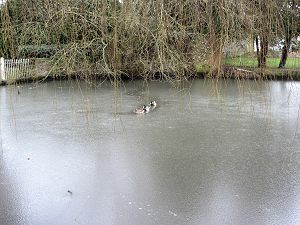 There was a thin layer of ice on the pond and three ducks were breaking a channel though it to get to us when we got our sandwiches out. Their efforts were rewarded with plenty of bread crusts. After lunch we headed north-west out of Kidmore End and into Gallowstree Common where we stopped for a drink at the Reformation pub. Refreshed, we walked through woodlands and open countryside back to Peppard Common where the walk ended. A few of us stopped off at the Red Lion for another drink (and to warm up) after the walk. 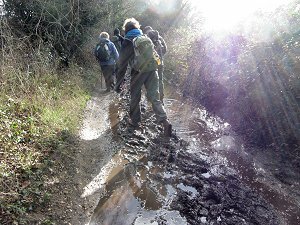 A good thing about the recent cold snap was that most of the mud was frozen so we stayed fairly clean throughout most of the walk, but towards the end of the walk we found some soft mud again! See our route on Google Maps. This walk had a film and TV theme to it, as many of the villages have been used for location filming for Chitty Chitty Bang Bang, The Avengers, 101 Dalmatians, Vicar of Dibley, Midsomer Murders, Lewis and Marple to name a few. Our leader, Mike, came armed with fascinating facts about them. Sixteen of us turned up on this first Saturday in March. The weather was dry but cloudy and only a few degrees above zero. Nonetheless with no wind to speak of and plenty of Chiltern hills to climb, we didn't feel the cold. 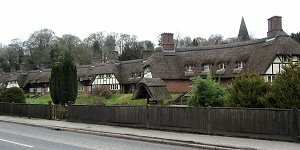 We set off from the car park by the Stag & Huntsman in Hambleden, heading north on the road passing the Manor House, then we turned right into the road that heads east to Hutton's Farm before turning north again and into the North Close Copse plantation. The route continued north through farmland and woodland through the hamlets of Rockwell End, Pheasants and Parmoor before turning west through Hatchet Wood to the village of Skirmett. Turning north again and heading toward Turville we passed by the aptly named Watery Lane, which seems to be flooded every time we pass this way. We crossed a field that ran alongside Watery Lane, which contained a stream blocking our path. Someone had thoughtfully placed a plank over the stream. 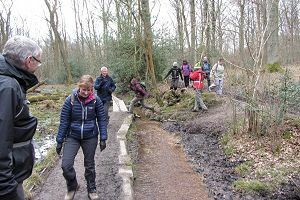 Although most of us made use of this makeshift bridge, some of our older members decided to leap across it instead! Trying to prove something? After stopping for our picnic lunch on Turville Hill, we entered the village from the north and immediately visited the Bull & Butcher pub. There was just enough room for us all inside the pub, which was nice and warm. Refreshed we set off south-west out of Turville, up and down through a mixture of farmland and woodland, in a loop back to Skirmett. We passed an organised group of children who were map-reading and navigating round the area. They seemed to be enjoying themselves. Heading south out of Skirmett, we took a slightly more direct route back to Hambleden, following footpaths that ran parallel to the Skirmett Road. This part of the route took us through open farmland and through the pretty hamlet of Pheasant's Hill. Here the footpath divided the gardens of the private houses into two. Each garden had a gate either side of the path to allow access to the owners. 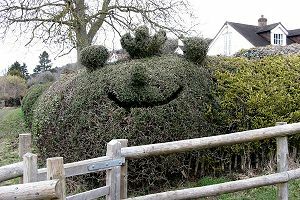 One gardener with a sense of humour had shown off his/her topiary skills with a strange-looking grinning gonk-style head. We entered Hambleden on the other side of the church from where we had started the walk. This gave us an opportunity to see more of the pretty little village. 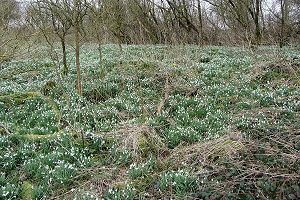 The recent spell of dry weather is definitely having a positive effect on the countryside, which is slowly recovering from the excessive rain of last year and the beginning of this year. We hardly got our boots muddy on this walk! A small number of us stayed on after the walk for tea and cake at a little shop, which also seemed to be the local grocery store and post office. You can see our route on Google Maps. Sunday 10th March seemed a rather cold and grey day after our recent preview of spring we had earlier in the week. 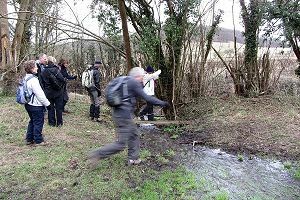 Twelve of us gathered in one of the free car parks in Whitchurch, Hampshire, for this walk led by Greg from the West Berkshire Ramblers group. 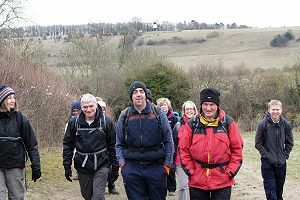 Most of attendees were members of the West Berks group but we also had a couple of newcomers and a couple of members from the Berkshire Walkers 20s & 30s group and our group. The walk passed the Whitchurch Silk Mill, which operated from 1815 to 1985 and is now a museum, then went north through the town before heading north-east into the countryside. 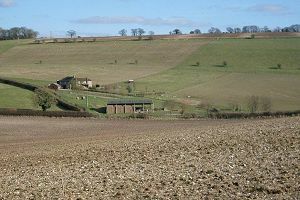 The route passed mostly through farmland and occasional woodland before turning south toward the village of Freefolk. After a brief coffee stop outside St Mary's church, we continued through the village where we saw a terrace of 18 thatched cottages. These originally housed estate workers and were built in 1939 so aren't quite as old as you would first think. As we left Freefolk, we stopped to have a look at the 13th century church of St Nicolas. A sign declared that it was no longer used for services but was still consecrated. Inside is the tomb of Sir Richard Powett and opposite it is a painting of two men holding tablets containing the Ten Commandments. We left the village, first heading south, and then turning west back to Whitchurch. The return route took us through open fields and then followed the wooded banks of the River Test, arriving back in Whitchurch by the old town mill. We walked through the town, taking in some of the sites, back to the car park. After the walk some of us stayed on to have lunch in Whitchurch. This wasn't as easy as expected as two of the pubs weren't doing food and the other pubs were all fully booked for Mother's Day lunches. Eventually we decided to split up with some people settling for supermarket sandwiches and others going home for lunch. A couple of us tried out the local Indian restaurant, which was very good. Even they had a Mother's Day Menu consisting of the chef's mixed platter starter and a main dish of your choice for £12.50! I had Chicken Nazakat, which I'd never heard of before, and it was excellent. 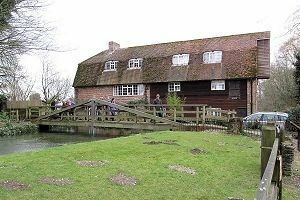 There is a Heritage Trail called the Mill Trail (published by Hampshire Country Council) that includes the villages we visited today on Greg's walk but it takes quite a different route. I might put the Mill Trail in our walks programme for later in the year. You can see the route we took today on Google Maps. Just when the ground was starting to recover, the rain is back! This walk on Saturday 16th March came after a night of heavy rain. In fact it was still raining hard as I left home and there were a few flooded bits of road on the journey. There was a certain look on the walk leader's face as we turned up to the empty car park. I think Jude was hoping no one would show up and she could go home! Instead there were five of us, clad in waterproof jackets and over-trousers, ready to go. The walk first followed Streatley Hill down into Streatley village where we made our way to the towpath on the west side of the Thames. 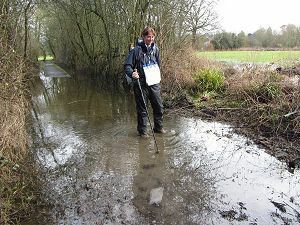 This wasn't as easy as it should have been as the footpath was underwater in places. After some wading we got to the tow path, but that wasn't exactly dry either. 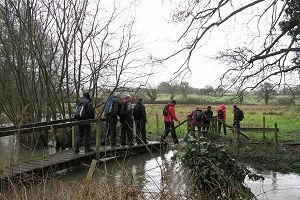 The rain had stopped by now and the sun was peeping through as we set off alongside the Thames on our way to Moulsford. This part of the Thames is quite picturesque and features a couple of locks (one at Goring and one at Cleeve). We stopped off at Cleeve lock for a quick snack and drink. After our break, we squelched along the tow path to Moulsford. On our way we saw a hugh number of geese and also a heron. The towpath on the west side of the Thames stops at the Beetle and Wedge Boathouse restaurant - a rather up-market place. Needless to say, we didn't stop there in our bedraggled state! We headed west, through Moulsford and out into countryside and farmland, where we stopped for our picnic lunch. A thoughtfully placed bench meant we didn't have to sit on the wet ground. From where we sat, we could see Thurle Down and Unhill Wood, both of which would be included on the second half of our route. 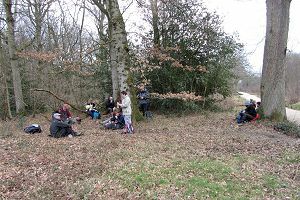 After lunch we continued west, crossing the A417 Wantage Road and through another farm before entering the plantations of Unhill Wood and Harcombe Wood, with their wide variety of different trees. The rain started again but luckily the route through the plantation was mostly paved and gave a good grip for this uphill stretch of the route. The rain didn't last long. 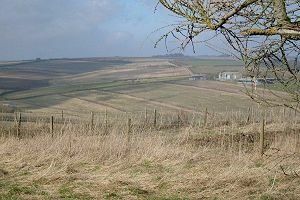 We emerged from the wood at Town Copse and turned east onto the ridge way path on the top of Thurle Down. We followed the ridge way almost all the way into Streatley before turning off south, though the golf course, and back to the car park at the top of Streatley Hill. 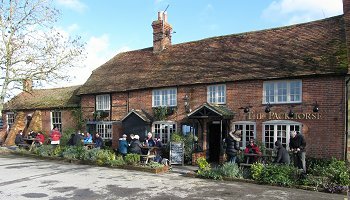 After peeling off our wet and muddy over-trousers and changing into dry footware, some of us went to The Bull in Streatley for a post-walk drink. This was quite an enjoyable walk despite the amount of paddling involved at the start. See our route on Google Maps. I didn't make it to the walk on Sunday 17th March. I had a bit of a cold coming on and my boots weren't yet dry from the previous day's walk (see above) so I decided against it. Christine was on this walk and she has kindly written the following words. She also provided the pictures. We met in good time for an 11:00am start at the car park for West Green House, a National Trust property. Due to the inclement weather the main car park was closed. However there was ample parking for the 12 hardy souls along the approach to the house or in the lay by opposite the entrance. 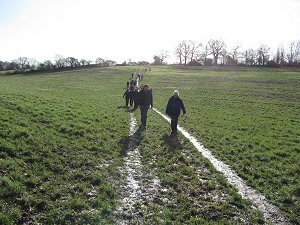 We headed across the common and made our way to the outskirts of Hartley Wintney, after passing the first obstacle - a slightly flooded field. Some of us kept to where the path should have been others tried to go around the worst of the flooding. Hazeley Heath was picturesque and the boarded walkways were welcome. A deeply rutted and muddy track proved not to be as challenging as it looked at first sight. We paused for lunch by the mill house at Dipley. Some took the opportunity to sit down, but most preferred to stand. Then on to Mattingley. 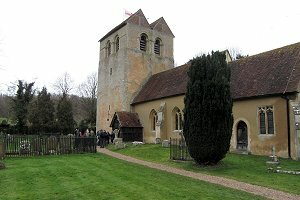 As the church appeared through the trees I thought it was a Tudor house until I caught sight of the tower. To the disappointment of some we did not stop at the pub - the thought of taking off wet outer garments and then having to put them on again was not appealing. Instead we made our way back to West Green House and partook of hot drinks and cake in the cafe. 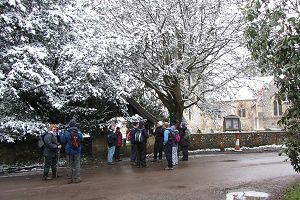 It was an enjoyable walk, despite the weather, and 12 ramblers returned safe and in good spirits. 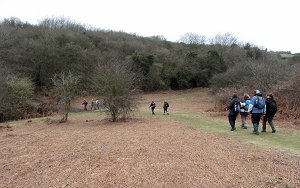 Even though we had intermittent showers for most of the day, those ramblers who also belonged to the National Trust braved the weather and looked around the gardens. 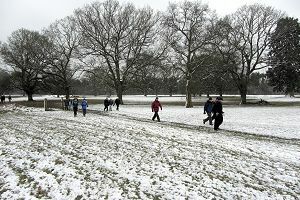 Seventeen of us set off from Henley on Sunday 24th March, well wrapped up in hats, gloves and lots of layers. We had a bit of snow the previous day and most of it was still around as the temperatures hadn't been above 1°C. You wouldn't think that Spring has officially started! Starting from Henley-on-Thames railway station, we walked north through the town and then joined the Oxfordshire Way heading up No Man's Hill. Atop this hill was pastureland with a few sheep sheltering for the cold wind. The Oxfordshire Way is a long-distance footpath that connects Henley-on-Thames with Bourton-on-the-Water in Gloucestershire. We only followed a short section before leaving it after Henley Park and following a route that took us to the village of Fawley in Buckinghamshire. We stopped in the village to admire the Church of Saint Mary the Virgin and to have a drink. Most of us had packed a flask of something hot - in my case it was coffee. I usually prefer tea, but it doesn't taste right once it's been in a flask. After our stop, we continued heading north up to Gussetts Wood. The snow was thicker in the fields up here and the wood itself had a magical look to it, with snow on the bare branches and twigs. A pleasant walk through the picturesque Gussetts Wood brought us out onto the road that passes Luxters Farm where there is a vineyard and brewery. We stopped at the shop by Old Luxters Barn, where all sorts of food and drink was available. Some of us did a quick spot of shopping. Old Luxters Barn has memories for some of us in the group, as two of our members got married here, just over a year ago. Needless to say, the produce of the vineyard and brewery was in abundance at the wedding reception. After making our purchases we crossed through the wood again, this time heading south-east, and stopped for lunch at the top of a snow covered hill, looking down toward Pheasant's Hill and Hambleden. There was one bench and seventeen of us, so most of us elected to eat our picnic standing up. 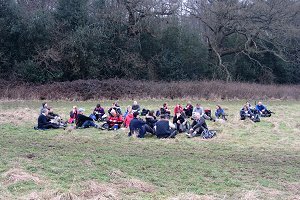 One or two hardy types sat on the ground. It goes without saying that we didn't hang around after eating. Once the picnic was over we got going again, heading south-east down the hill, through a couple of field and over the Skirmett Road into Pheasant's Hill. From there we turned south and followed the route we had taken a few weeks before, through Pheasant's Hill and into Hambleden. The snow was quite absent at this lower altitude. Once we arrived in the village, we visited the recently re-opened Stag and Huntsman pub for a drink in the warm. Refreshed and warmed up we left Hambleden on a footpath parallel to the road leading to Mill End. 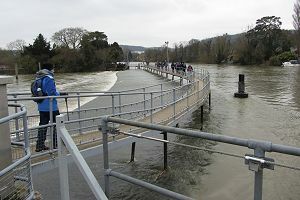 This squelchy path took us to Hambleden Lock, where we crossed the Thames on the metal walkway over the weir. 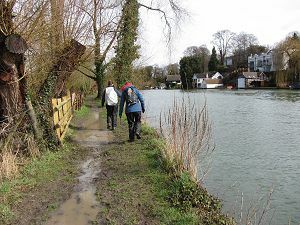 Rather than following the Thames path back to Henley, we took a route through the hamlets of Aston and Remenham before crossing the Thames again at Henley Bridge. This 13 mile walk was hard work at times but rewarded by some spectacular views and a wide variety of different types of terrain. You can see our route on Google Maps. 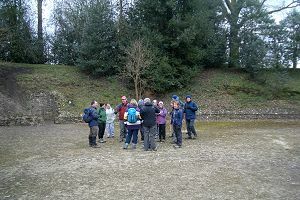 Sixteen of us met up at the Wall Lane car park in Silchester for this Easter Saturday walk. 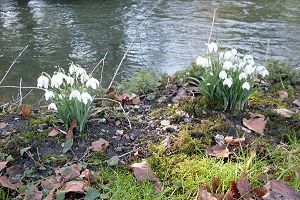 Although the temperature was only 4°C (10 degrees below the seasonal average) it was dry and the sun peeped through the clouds at regular intervals. The first part of our walk explored the remains of the Roman town of Calleva Atrebatum. We entered at the west gate and walked along the north wall to the east gate before taking a slight detour to look at the amphitheatre outside the walls. We re-entered the walled town via the churchyard of the 12th century church of Saint Mary the Virgin. 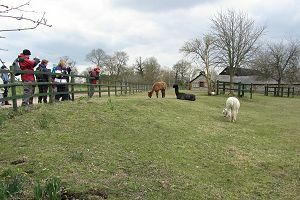 There was an enclosure nearby with three alpacas grazing - one white, one brown and one black. Enough colours there to make a fetching scarf or jumper. From there we took a route across the middle of the Roman town, passing the site of the archaeological dig, which was closed and full of water. We departed the town at the west gate to make our way to Pamber Forest. First we headed south and then south-west across farmland and woodland, most of which was easy-going, until we entered Pamber Forest. From there on, the route we took seemed to regularly swap from dry, well-made paths to swampy waterlogged dark-brown sludge. Fortunately we were on dry, well-drained soil by the time we stopped for our picnic lunch. After we'd finished, we headed north-east through the forest, encountering more waterlogged paths and crossing a number of streams. We finally emerged from the forest behind a residential area of Silchester, a short distance from the Calleva Arms, a characterful pub where we stopped for a drink. Suitably re-hydrated, we finished the last mile of the walk by crossing the football pitch and taking the path back to the west gate of the Roman wall. From there we retraced our steps back to the car park. At only six-and-a-half miles, this was a fairly short walk but it still had a good variety of scenery and terrain. You can see our route on Google Maps.